Many of us love to get a nice tan during the warm months. Unfortunately this means that we are often exposing ourselves to the sun’s UV rays for much longer than is healthy. Exposing yourself for too long can also result in painful sunburn which is not only very painful but not quite the attractive tan that you were hoping to achieve. People with lighter skin are far more at risk of sunburn than darker skinned people with more melanin in their bodies. The best way to avoid sunburn is to avoid exposure to the sun for too long especially if you have lighter skin. If however you find that you have a nasty sunburn, there are plenty of very effective natural treatments that can help soothe the pain and prevent your skin from peeling later on. Here are some of our favorites. Baking soda is a very cheap and convenient method of soothing your sunburned skin. It is alkaline in nature and also has excellent antiseptic properties that can help relieve the irritation and pain. Fill up your bath with cool water then add a cup full of baking soda and stir it into the water well. Soak in the tub for at least 15 minutes then get out and pat your body gently dry. Repeat every day and your burn should clear up pretty quickly. Another option is to use the baking soda to make a topical paste. Mix some baking soda with the right amount of water to produce a nice smooth paste. Apply the finished paste to the affected parts of your skin with some cotton wool. Leave the baking soda on your skin for at least 10 minutes before washing it off gently with plain water. Repeat once or twice each day for as long as you need. Aloe vera gel is well known for its various skin benefits and it is a wonderful remedy to soothe the symptoms of sunburn including pain, inflammation and redness. You can either use fresh aloe gel directly from the leaf or use a ready made gel. Cut an aloe leaf lengthwise and extract its gel then put it in the refrigerator to cool for 30 minutes or so. Apply the gel to the sunburned parts of your skin. Let it absorb into your skin and dry naturally. Repeat the process several times each day until your skin has healed. Oatmeal is great for eating but did you know it can also be used to treat sunburn? Oatmeal has soothing anti-inflammatory properties that are perfect for treating soreness and irritation caused by sunburn. Fill up you bath with cold water. Add one cup of your oatmeal then stir it in well. Jump in the tub and soak for at least 20 minutes. Pat your body dry very gently or simply allow your body dry naturally. Repeat once or twice a day until your skin has healed. You can also apply cooked oatmeal to the skin directly. Cook up some oatmeal with water but make sure it has a thinner consistency than usual. Allow it to cool thoroughly and then apply it to the sunburned areas of your body. Allow the oatmeal to sit on the skin for at least 30 minutes before rinsing it off gently with cool water. Repeat several times daily until your skin is better. Apple cider vinegar is used for a wide range of conditions including many skin complaints because of its antibacterial and astringent properties. It can also be used to help soothe the pain and irritation caused by sunburn and help speed up your healing. Fill up your tub with cool water and add a cup or so of apple cider vinegar. Soak in the tub for around 30 minutes. Repeat each day for as long as necessary. Mix a cup of apple cider vinegar with an equal amount of water. Put in a bowl and soak a towel in the mixture. Apply the towel to the affected area for up to 30 minutes. Repeat several times each day for as long as you need. Simply applying a nice soothing cold compress to your skin can quickly relieve your pain and irritation. A cold compress will allow the blood vessels of the skin to constrict and reduce inflammation while it can also ease the pain of your burn. Wrap some ice cubes in a cloth or damp towel. Apply the cloth to your skin and hold it in place until it is no longer cool. Repeat several times each day. You can also make a compress with milk because milk has excellent anti-inflammatory effects for your skin and can relieve the pain and irritation of sunburn. Combine a cup of milk with 3 or 4 cups of water and a handful of ice cubes. Soak a cloth in the mixture, ring out the excess and apply it to your skin for 30 minutes or so. Repeat throughout the day whenever you feel pain and irritation. Raw potato contains natural starches and other properties to help draw heat out and soothe the skin. A potato paste makes for an unusual but effective remedy for your sunburn. Peel 2 or 3 large potatoes then cut into small chunks. Blend with a little water in your blender to make a smooth paste. Apply this paste to your burns and let it work until it has dried. Rinse off under a cool shower. Both types of tea are full of antioxidants that can help treat damaged and burned skin very effectively. The tannins in tea help protect against UV damage and can also reduce inflammation. Use 3 teabags to brew up a pot of tea. After letting them sit for a while, remove your teabags and let the tea cool down. Dip a cloth into the tea and gently dab it onto your skin. Repeat the process several times each day. Virgin coconut oil has a unique range of compounds that are great for the skin. It can be used to treat a wide range of skin complaints like psoriasis and eczema and is also a great remedy for sunburn. Coconut oil contains vitamin E that helps reduce inflammation while it is easily absorbed by your skin and helps it to stay well moisturized. Warm up a little virgin coconut oil in your microwave. Massage a liberal amount into the burned areas of your skin. Honey is also great for the skin. It has antibacterial and anti-inflammatory properties but can also help the skin retain moisture which is great for sunburn. Apply a thin layer of good quality honey to the affected area of your skin. Let it sit, absorb and dry of its own accord. Repeat once or twice each day until your skin has healed. 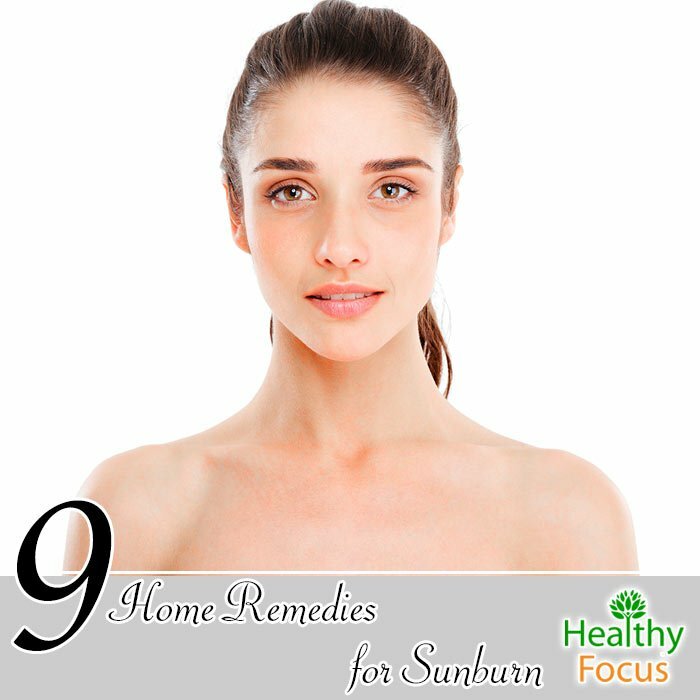 If you are suffering from sunburn and want to try a natural remedy that really works, why not give one of these remedies a try. Let us know how it worked out and nd let us know if you have any other natural remedies that we can add to our list.